The Honiara seed centre was the only Planting Material Network (PMN) seed multiplication and processing centre until regional centres were established in 2001. The Centre, located in Honiara, capital of the Solomon Islands, remains the project base for the Kastom Gaden Association (KGA) and PMN. 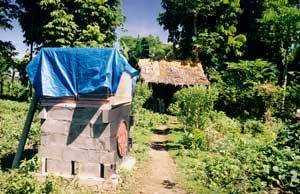 Fruit trees grow among the vegetables in the Honiara garden. The garden demonstrates the mixed-species approach to agroforestry taught by the PMN and Kastom Gaden Association. When the Kastom Garden Project made its start at the Burns Creek centre in 1996, there were two staff – Tony Jansen and Roselyn Kabu Maemouri. The number now employed by the Kastom Gaden Association and the Planting Material Network has grown to around eight. Some of these are located in the provinces and the remainder at Burns Creek. The house and office was constructed in the traditional Solomon Island style with woven pandanus walls and sago palm roof. Until they were stolen when hostilities between the Isatambu Freedom Movement and the Malaitan Eagle Force broke out in mid-2000, the project centre drew its energy from the sun via a cluster of photovoltaic panels. It was late connected to the electricity grid thanks to the assistance of AusAID. 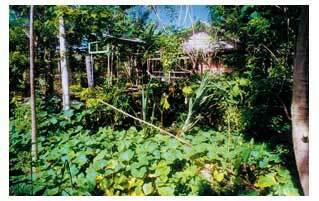 the seed production garden for the Solomon Islands Planting Material Network which occupies the greater area of the site and in which seeds are grown out and harvested for processing, packaging and distribution. taller trees grow overhead, forming a canopy. In appearance, the garden bears a resemblance to tradition Pacific Island forest gardens. The garden is the site for the assessment of different methods of keeping chickens. The assessment was made because eggs and chicken meat could provide a source of protein for village families. Australian poultry expert, Russell Parker, has provided training workshops in poultry keeping at the Honiara project centre. Russell runs PermaPoultry in Australia. His manual on improved poultry keeping in the Pacific – Kai Kokorako – is being produced by TerraCircle. The project centre became well known after it was built in 1996. Visitors now come by to make contact with the agriculture program, to look at the garden and to collect seeds. At its height, the garden took on an educational focus with seed curators, Mary Timothy and Wendy Betsy, guiding groups of visitors through the site. Another important component is the Planting Material Network nursery. Situated between the office and the garden, the nursery consists of rows of raised planting boxes. In these, new plants for the garden are started and the viability of seeds to be distributed through the Planting Materials Network are tested. By 2004, the Burns Creek centre had undergone significant change. the house and office have been enlarged to accommodate additional staff.